The celebration over, the weary bride rests on a settee, one satin glove dropped on the floor. 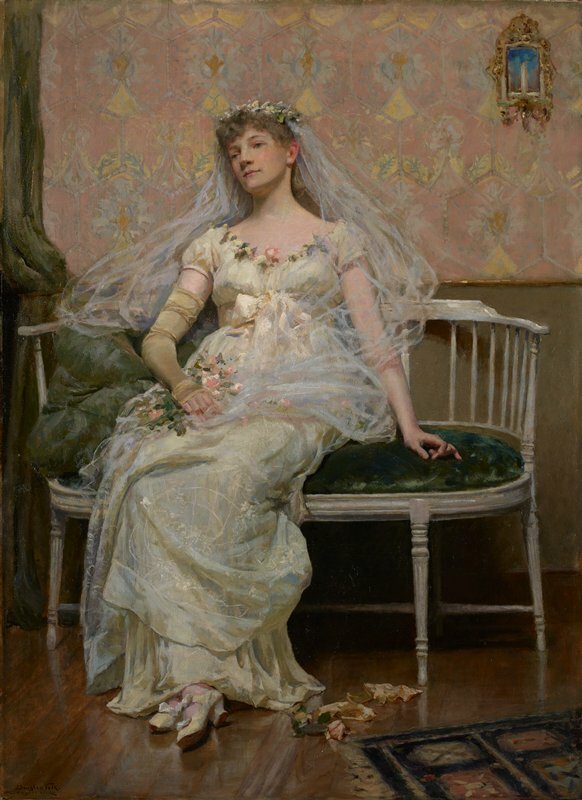 Caroline Thompson is the bride; the artist, Douglas Volk, was a friend of her parents. At one sitting for this painting, Volk adjusted the neck of the gown to reveal more of Caroline’s shoulder. As the young woman blushed, her mother remarked, “Now, my dear, Mr. Volk is an artist and he only thinks of you as he would a vase of flowers.” Mrs. Thompson’s esteem for Volk was warranted. He had trained in Italy and France, and in 1886 he became the first director of the Minneapolis School of Fine Arts, now the Minneapolis College of Art and Design. Recent conservation of this picture was made possible by a generous contribution from Al and Dena Naylor through the Adopt-a-Painting program.